Posted by Cyril. January 22nd 2015. 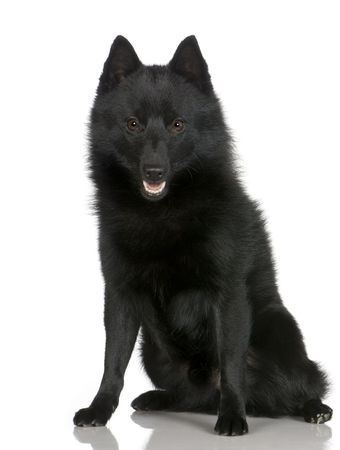 The name of the energetic dog, Schipperke has several supposed origins. Somewhat mistakenly, Schipperke was taken in English speaking countries to mean ‘little boatman’ because of the dogs’ appearance on boats and barges in their native country of Belgium. However, boating was a secondary task for the Schipperke. Originally, they were descendants of shepherding dogs which worked in 17th century Belgium. It is in fact this role where the name originates from. Recognised formally as a breed in the 1880s, prior to the name being formalised, the Schipperke was known fondly as a ‘Spit’ or ‘Spitzke’ – a common nickname for small dogs with pointed ears. These swift and cunning little dogs made good use of their shepherding intelligence during World War Two, when the Belgian Resistance used them to carry messages between resistance cells. Luckily the occupying Nazi forces didn’t realise the true function of the Schipperke. The Schipperke is a uniquely handsome dog. The breed is either black or blonde and its overcoat fur is shiny whilst the warming undercoat is soft and fluffy. Its famous pointed ears are on the top of its head allowing the dog to look alert and ready at all times. Tails vary from country to country. In some places the tail is docked at birth. Where docking is banned – puppies are born with tails of different lengths so, as they grow, they naturally vary in appearance from dog to dog. The Schipperke can weigh anything from 3 to 9kg. Unsurprisingly for a dog that trounced an occupying force, Schipperkes have an inclination to be stubborn, mischievous and wilful. They are curious and very energetic so in need of plenty of exercise. Chasing small animals is one of their favourite pastimes. 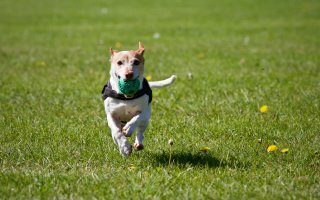 In short, they need to be trained early on and diligently in order to tame their independent characters – and bring out their best traits which include agility and obedience. They are challenging but rewarding dogs to own so are perhaps not suited to first time dog owners. 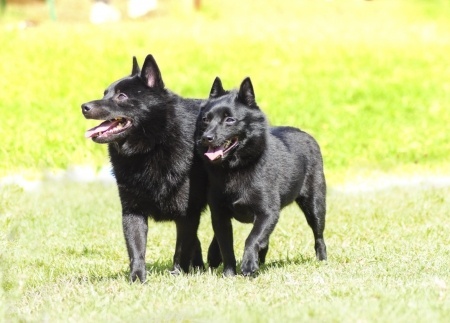 Mostly of a good constitution, the Schipperke can suffer from one mutation that affects balance and negotiation of obstacles. About 15% of the population is affected with signs appearing anywhere between two and four years of age. On the grooming front, this dog does not require costly or routine grooming although it is a moderate shedder. Therefore, it is recommended that the owner brushes the undercoat – which sheds the most – weekly. One point worth noting is the Schipperke’s tendency to ‘blow’ its coat several times a year during which they lose their undercoat. This occurs in female dogs more so than males. The shedding process can last a few weeks. Warm baths will help in the removal of the shedding fur before you find it around your house. The rough area found around the neck is natural so there is no need for special grooming in this area.